Daniel Ricciardo has finished as the fastest driver on the second day of Formula One 2015 pre-season testing at the Circuit de Catalunya in Spain. The Red Bull driver set the fastest time of the test so far after completing 142 laps, which is also the most amount of laps completed by a driver today. 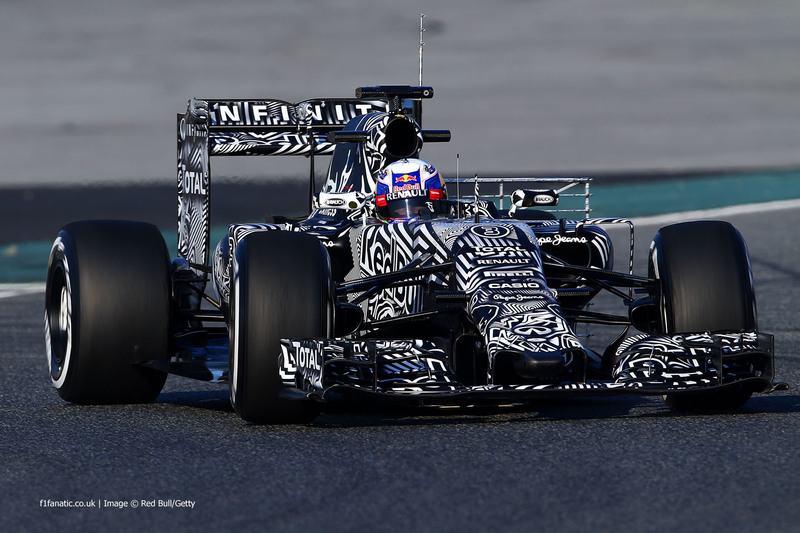 The Red Bull, still adorned in its camouflage testing livery, had a shaky start to testing at the first meeting in Jerez, but it appears that the RB11 is starting to come good for the team. Kimi Raikkonen was just 1 hundredth of a second slower than the Australian, meaning that he finishes 2nd on the time-sheets. The Finn completed 90 laps of the circuit and will hand the Ferrari over to team-mate Sebastian Vettel for the final two days of the four day test. Just one tenth behind Raikkonen was his former Ferrari team-mate Felipe Massa, who clocked the third fastest time in his Williams after 88 laps. The times continued to be close between the first few drivers, with Sergio Perez just under two tenths off of Ricciardo in the 2014 Force India. The Mexican was one of four drivers to complete over a century of laps. After not being able to use either of their race drivers yesterday due to illness or injury, Mercedes elected to split the days running between Rosberg and Hamilton. The pair completed a combined total of 155 laps, with Hamilton 5th fastest after 89 laps and Rosberg 6th fastest after 66. Six tenths separated the 2014 title rivals. After a technical issue yesterday threatened to limit today’s running for McLaren, Fernando Alonso impressively managed 59 laps of his home circuit; the most amount of laps completed by McLaren during pre-season testing so far. What’s more, Alonso was only 1.4 seconds off of Ricciardo after setting a best lap of 1’25.961. McLaren’s pace seems to be improving all the time as pre-season testing goes on. Newly signed Lotus third driver and reigning GP2 champion Jolyon Palmer was behind the wheel of the E23. The British driver completed 77 laps with a best time of 1’26.280 to put himself 8th out of 10 runners. Marcus Ericsson was 9th fastest for Sauber with a total of 113 laps under his belt. The Sauber stopped in the last hour of testing on the start/finish straight. The Swedish driver was at least met with a short walk back to the garage. Carlos Sainz was the last driver on the time-sheets for Toro Rosso. He was the last driver to complete 100 laps or more despite having caused a red flag after a mechanical failure.